Leica Dealer al la carte demo set, showing your options in the Leica M a la carte world, courtesy of Los Angles Leica Super Dealer Tony Rose. Why make this guide? Because the last thing you want from your new specially made M is low resale value. The a la carte option marks an important turning point for the rich masses, the ability to fine tune your own custom M without having pull at the factory. It's a neat idea introduced at Photokina 2004. 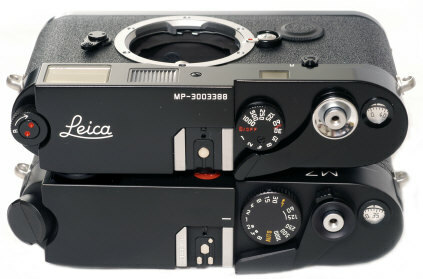 1) Leica MP or Leica M7? Both are great cameras. Surprisingly the more traditional MP is outselling the more modern and more feature laden M7 about 60/40. Buy one or the other, but think twice before you buy both. Why? because the shutter speed dials rotate in opposite directions from high to slow speeds. This translates to an easier chance of lost shots -- IF you take the M7 off auto and turn the shutter speed dial the wrong way with a quickly changing subject. IF you main camera is the M7, a M6 TTL is an arguably better choice as a mechanical M7 companion, because the shutter speed dials rotate in the same direction. IF your main camera is the MP, a Voigtlander R2A or R3A , Konica Hexar RF, or the new Zeiss Ikon are arguably better choices as an AE camera companion to your MP, because the shutter speed dials rotate in the same direction. Or maybe not. Just be aware of the shutter dial issue, and make the best choices for you. How did this happen? The M7 came out in 2002 when the M6TTL was in production. 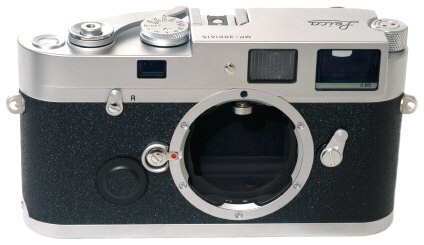 The M6TTL was then replaced in 2003 with the MP with the traditional shutter dial rotation. 2) Finish: Black Paint, Silver Chrome, or Black Chrome? Historically over the last 50 years, Black Paint cameras have proven themselves to be worth more. The beautiful silver chrome is also a fine choice. However, I urge you to avoid the black chrome finish. Take a look at a worn M4-2 or M4-P and you will see why. Black chrome cameras wear downright ugly. Why was black chrome ever introduced in the first place? Because it was and is cheaper than a black paint finish. If you are ordering the MP, do yourself a big favor and choose the M7 style rewind crank. Your camera will be easier to use, and worth more in the long run due to the rarity. 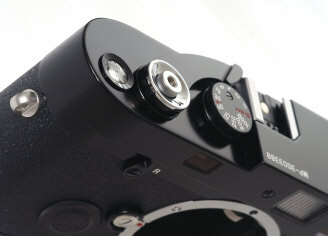 4) Plain top or Classic Leica Engraving? From a long term value standpoint there is only one choice -- the Classic Leica Script engraving. This choice will likely make it easier for you to eventually sell the camera. IF you are choosing silver chrome, choose the no extra cost silver trim. Why? Because the plastic tipped advance lever is more comfortable to use. The black paint trim will also look good on a chrome camera, if you prefer the all metal film advance. If you are choosing black paint, choose the black paint MP trim. Silver trim on a black camera looks odd and will not help the resale value. 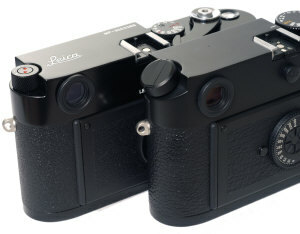 The simple fact is that despite all of Leica's tinkering with body covering choices, the traditional vulcanite is far and away the most popular -- and will stay that way. Vulcanite will likely make it easier for you to eventually sell the camera. 7) .58 .72 .85 Finder Magnification? Choose whatever suits your needs best. The .58 has a better finder for the 28 and 35 framelines. The .72 is the best choice for all focal lengths. The .85 has a better finder for 50 and longer framelines. Be aware the .58 and .85 finders are now offered only in the a la carte program -- or special edition cameras which may come out from time to time. Your camera will have higher resale value if you choose the complete frameline set of whatever finder magnification you prefer. Unless you are a world famous person or a world famous photographer, having yourself committed until the urge to have your name engraved on the camera passes may not be a bad idea. A camera engraved with the name of an average Joe or Jane will translate to reduced resale value by 30%. Why? The next owner will not likely want your name on their camera. IF you ordered the above combinations for US delivery on 11/18/2004, the MP configuration suggested above would set you back $4070, the M7 configuration $3930. In November 2004 the dollar is falling and the Euro rising, so I would expect Leica prices to go up further if this trend continues. 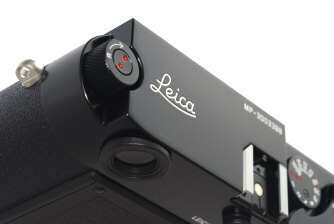 In the US, there will be only 40 a la carte Leica dealers. You have to configure your camera on line at the Leica site, and then pay for it at an la carte dealer. Or you can visit your dealer first and see samples of same. It is an interesting experience, complete with a special 3 camera a la carte camera case. 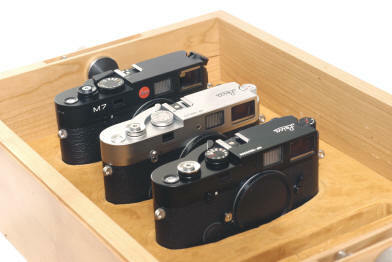 The bottom line is that you can have your very own flavor of Leica M, not a bad option when you think about it. Revised: November 28, 2004 . Copyright © 2004 Stephen Gandy. All rights reserved. This means you may NOT copy and re-use the text or the pictures in ANY other internet or printed publication of ANY kind. Information in this document is subject to change without notice. Other products and companies referred to herein are trademarks or registered trademarks of their respective companies or mark holders.